A talented Iranian artist from the city of Babolsar in the northern province of Mazandaran creates beautiful artworks by carving pumpkins. From the West to the East of Mazandaran, there are hundreds of products created with the innovation and art of Mazandarani craftsmen and the native culture and lifestyle of the province. They mostly include wooden containers and woolen or cotton clothes and dolls. 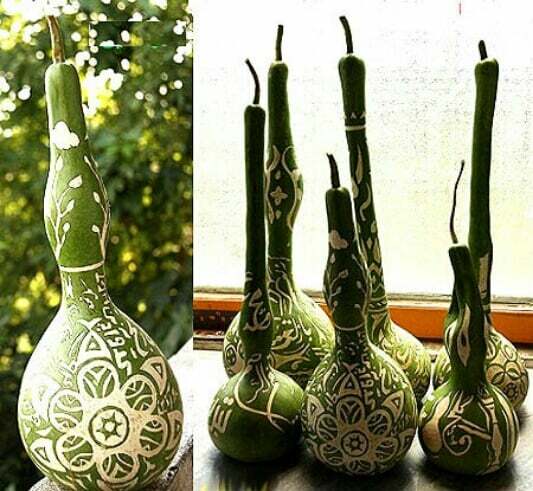 However, a Mazandarani artist named Hamid Reza Golmohammadi has been able to receive the permit to launch a workshop for engraving and paintings on pumpkins. Golmohammadi, who received a badge of innovation in arts in 2000, has showcased his works at various exhibitions inside and outside the province. According to ISNA, at first the artist used to make the artworks just for fun, but during various handicraft exhibitions, he decided to make money out of his art. Therefore, he started to produce works that come to use. Since then, in addition to producing decorative works, he made works such as vases, lamps and wall mirrors decorated with pumpkins. Boxes, musical instruments, and other home stuff are among his other products. Golmohammadi believes that a handicraft artist can create valuable works of art that can last a long time and be kept as an ornamental piece in exhibitions. He says it is also possible to produce stuff that all people can purchase, so that they enjoy it and the artist can earn money.